The reason why we are where we are in our lives is simply generated by a series of life choices and habits. From what we choose to eat for breakfast, to what we decide to wear, to whom our friends are, has been made by a decision or a choice. At times, it’s almost as if our lives are programmed. We wake up only to make the same decisions, over and over again, because, well, we are creatures of habit. One of the teachers I used to work with at school drove to work and parked in the same exact spot every day in the parking lot. Were the other spots any different? Not to anyone else at school. However, any day that there was a substitute teacher or a parent visitor who parked in her spot, we all had to hear about it. She had created that habit of parking in that same spot for years. Now while being set in your way on a parking spot may not affect your life all that much, what about all the other habits we choose? When the alarm goes off, is it hit the snooze, or is it get ourselves directly out bed? At lunch time is it order the salad, or go for the cheeseburger? After work, is it hit the couch, or hit the gym? During down time is it listen to a podcast, or mindlessly scroll through social media? Why is it then that we choose one over the other? Because its… comfortable… an easy choice, because it makes us happy right now. It feels better in the moment to sleep in, go for the comfort food, relax on the couch and skip the reading, so that’s exactly what some of us go for. The problem with habits is …they’re habits! Some that are decades in the making. 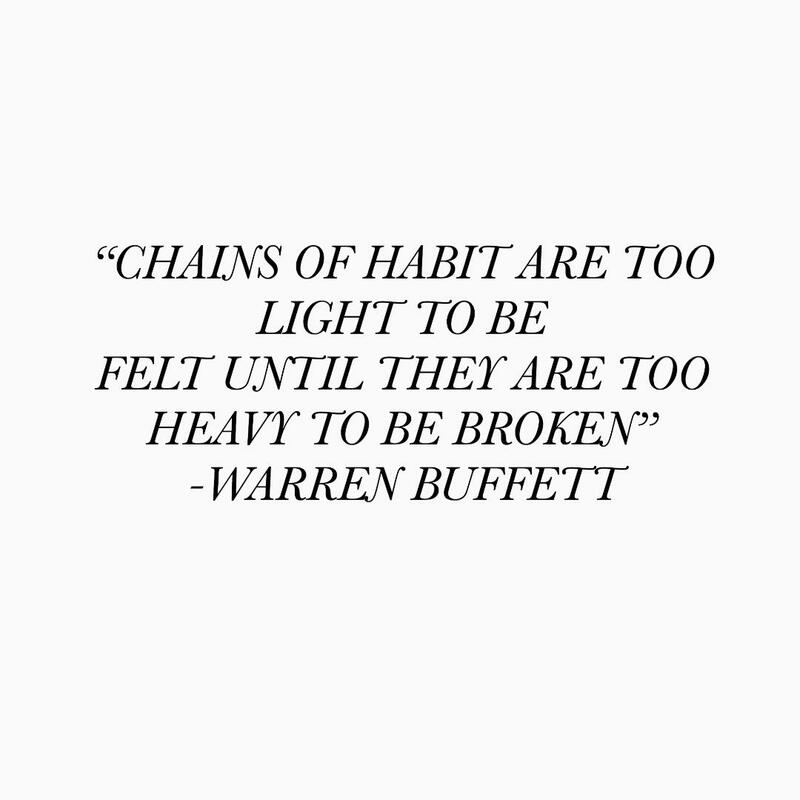 Fortunately, with many of these bad habits we have accrued, it’s ourselves that has taken the time to build these chains of habit and fortunately, it’s also ourselves that can choose again. Even the smallest change can make a difference in our lives. It’s not just knowledge than can move us towards creating better lives but our habits that you and only you can develop. How can we expect different results if we keep choosing to make the same decisions and allow our habits to dictate our lives? When was the last time you really realized how much of a choice you had? What would happen if you just started doing little life swaps? Even if they weren’t easy decisions to make, but actually moved you towards what you really wanted? When you make one swap, the next swap becomes easier. Why? Because self-control develops. All these little life swaps put you in the driver’s seat of your life and your self-control is strengthened. You begin to see that it isn’t actually as hard as we may have made it out to be. And just because you swap it today doesn’t mean its living without the choice you have given up forever. It’s not that you will go the rest of your life never hitting the snooze or going for the carbs but it’s the acknowledgment that each decision is in fact a choice. In relation to your health on your next break, instead of wasting time on your phone could you take a ten-minute walk? At your next meeting could you swap the bagel for the fruit? In relation to your goals, could you immediately wake up and tackle an item closer to accomplishing them? In relation to your career can you swap late night television watching and read an article that could help you at your next work meeting? In relation to your wallet, could you pack your lunch instead of paying $10? And watch that savings add up? Or for you, could you swap the friend that doesn’t serve your life with the best intentions for someone that pushes you to grow? -What is a life swap you can make today that would help benefit your life? -What are some of the barriers getting in the way of making that life swap and how could they be removed? -How can you begin to create self-control for your life and begin to override those habits getting in the way? however, it may not be the best choice in the long run.